I have now had the pleasure of seeing Dr. Afra three times over the last two years. 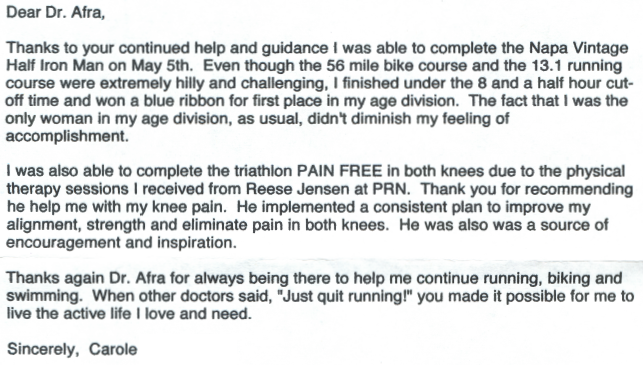 While I wish we weren’t such frequent patients (2 broken arms and a broken toe between my two girls) I am thankful Dr. Afra has supported us through each challenge. He is wonderful with my children (10 and 12) and does a great job of explaining their short-term limitations with sports while encouraging their athletic drive. No one wants to see their kids hurt or in pain but you can trust Dr. Afra will take exceptional care of them and put your mind at ease! Really impressed with Dr. Afra’s listening and method of discovery. I’m sure he had heard my story/issue 100’s of times (weekend warrior, my back hurts, what do I do?) He gave me practical advice with a plan that fit who I am as a person. Recommendations were simple yet effective and he put the responsibility on me to get myself better. Thanks Dr. A! What a wonderful doctor warm, caring, makes you feel like family and expaining everything so you clearly understand what is happening with your injuries his staff down to the techs are so friendly and sweet and careful with your body it was really the best ortho doctor i have ever been to. and i haave broken parts of my feet several times in my youth so trust me i know and a lot of times the doctor just breeze you thru. He is amazing not only with adults but children, they leave with a smile and a lolipop if they want. 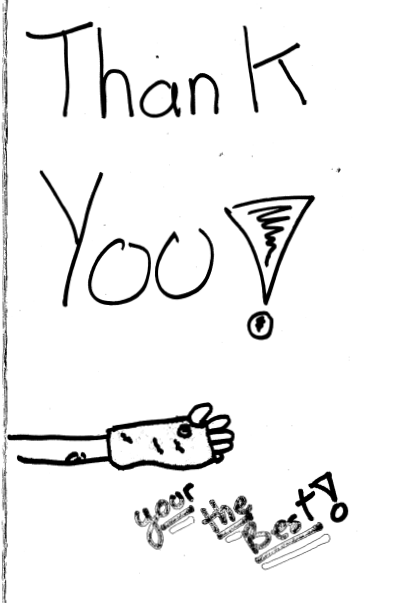 i have seen a lot of children there Truly an amazing an place kind of wish my next appointment wasnt my last!!!!!!!! Love this man, the techs, and receptionist besides they are all so cute!!!!! I was referred to Dr. Afra for a sprained wrist through workers comp. 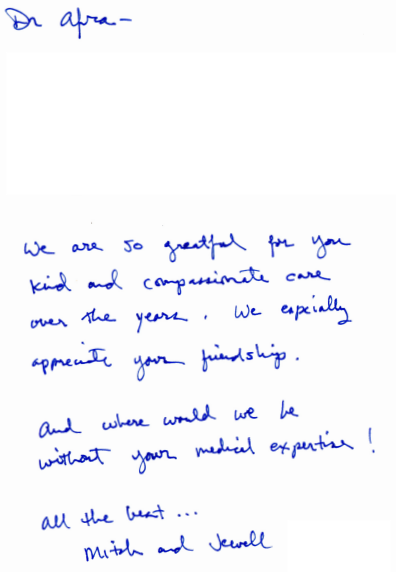 Dr. Afra was very personable and warm. He was very knowledgable and took the time to explain diagnosis. He was always willing to listen to my concerns and preferences rather than other doctors who tell you what you are going to do. 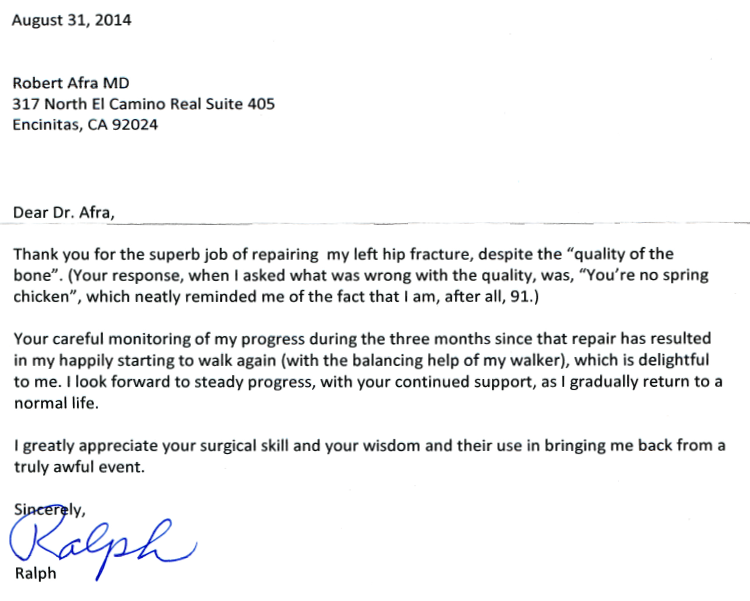 I highly recommend Dr. Robert Afra to future patients. Dr. Afra treated my wrist injury for many months. Today, it is feeling great and I am very thankful. Dr. Afra is a kind-hearted doctor with a lot of patience, knowledge, and expertise. In addition, his staff members were wonderful. I would recommend Dr. Afraa to any and all with a sports injury needing an orthopedic sports doctor. I broke my foot running down some stairs. The day after my accident, Dr. Afra was the only Orthopedist who had time to treat my injury that same day among the 10 or so practices I called. The doctor was very calm and patient in explaining exactly what the concerns were about my injury and what my treatment options were. He gave me all the time i needed to decide on what path to follow and was fully supportive of my decision. He was also very kind and helpful during follow up visits. I truly recommend Dr. Afra for his excellent people skills, great patient care and the concern he has shown for me as his patient. I am now on the path to recovery and I am fully confident that my foot will heal completely. 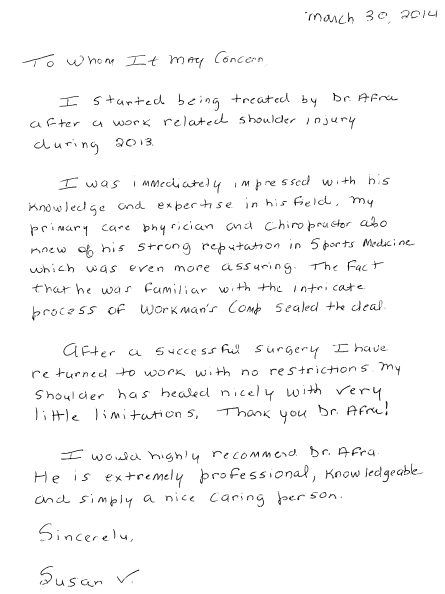 Dr. Afra has helped our family through multiple injuries this past year. Both of my children have broken bones, as well as my son developing pain in his achilles tendons. 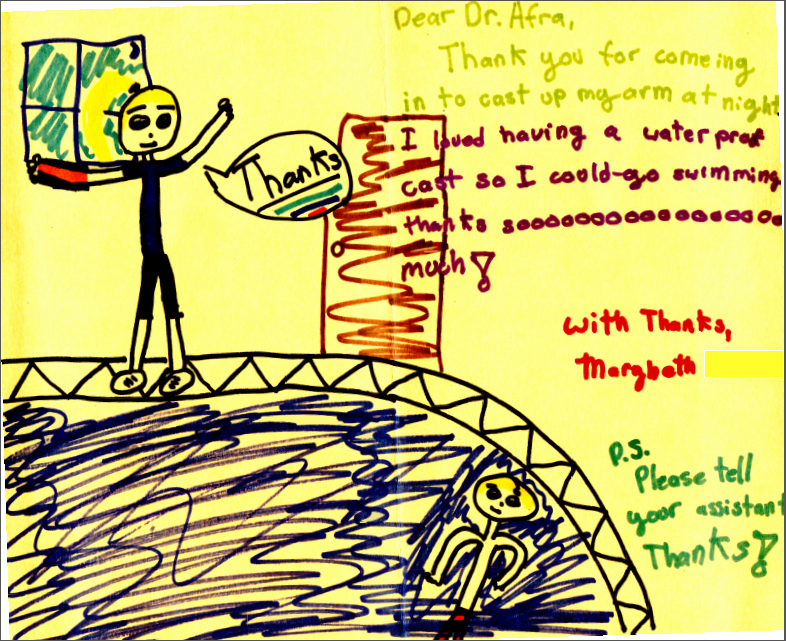 Dr. Afra is patient, warm, smart and open to alternative therapies. At his suggestion we also visited an acupuncturist to help aid in my son’s pain, which was enormously helpful. 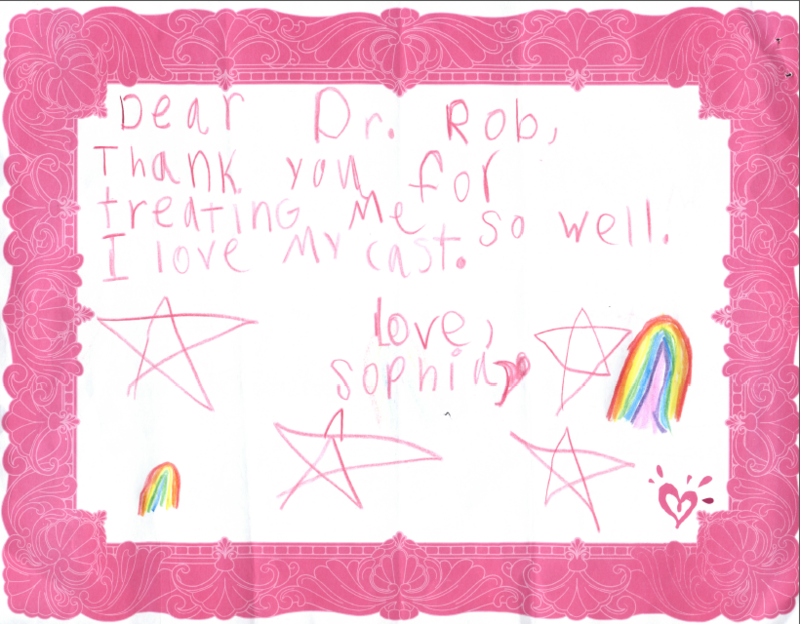 Having two very active (and injury-prone) children, we end up seeing Dr. Afra frequently. The entire staff is accommodating and friendly, and we’ve always been able to get an appointment quickly in an emergency. He considers the whole picture when treating his patients. 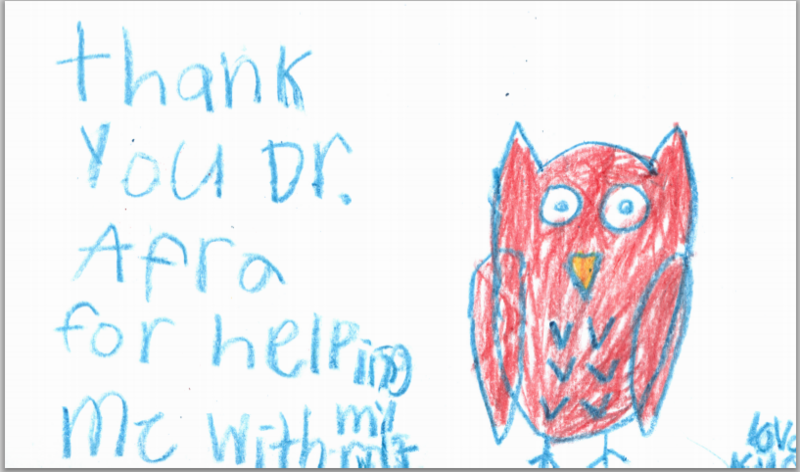 We are so lucky to have found Dr. Afra and his practice. I was impressed with his professionalism and that he personally saw that I was 100% satisfied with my visit. Dr. Afra if very knowledgeable and has been practicing for quite some time. He does well with involving the patients in informed decision making, takes a patient-centered approach, and looks at the whole picture. He does a great job explaining instructions and is quick to get back with me whenever I have a question or concern. His staff is friendly and helpful with scheduling as well. As a nurse, I would definitely recommend him as he is very well versed in various surgical approaches. 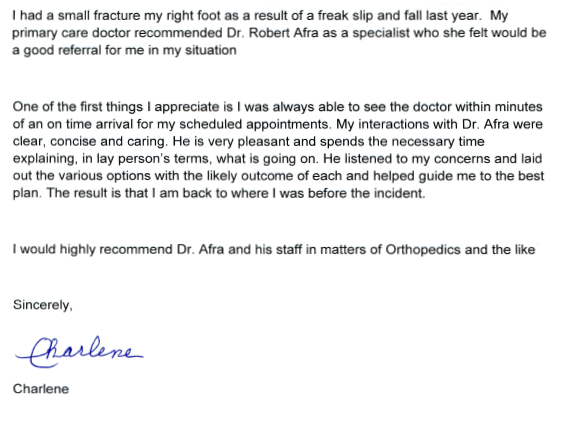 I am usually not one to write reviews but I wanted to for Dr Afra. What stands out the most about him is that he listens, he makes time for you if you need to see him right away, he lays things out very clearly so there is never confusion and he really does care about his patients. I have had to go to him multiple times in the last month and every time, always patient and always has a plan to set in action to help me feel better. I totally recommend him if you are looking for an Orthopedic Doctor. 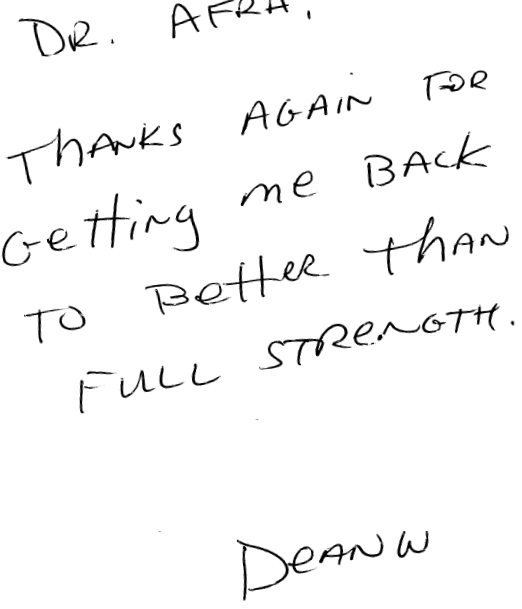 Dr. Afra was recommended to me by another doctor when I was looking for help with my lower back pain. Of course I yelped him and after reading his reviews I quickly made an appointment. 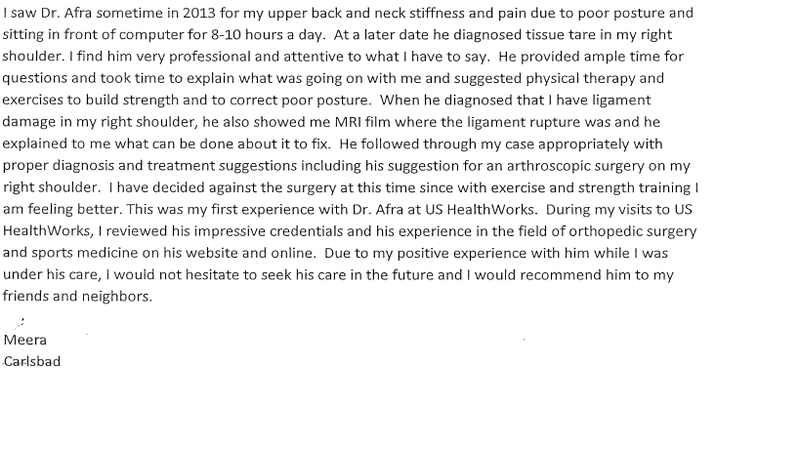 I found Dr. Afra to be a good listener and very helpful with his recommendations for controlling my back pain. I would recommend Dr. Afra for any orthopedic issues that may crop up in your life. 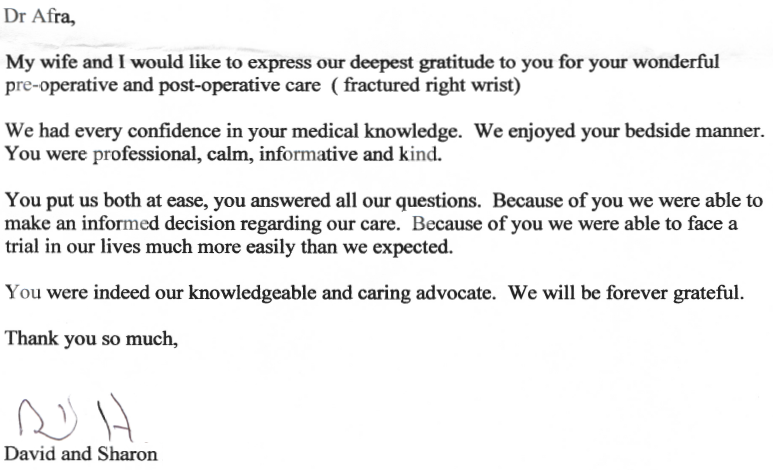 My 3 year old son broke his leg and we were referred to Dr. Afra by our pediatrician. His office was friendly and helpful. It’s really convenient that they have X-ray available in their office. Dr. Afra was attentive and never rushed. 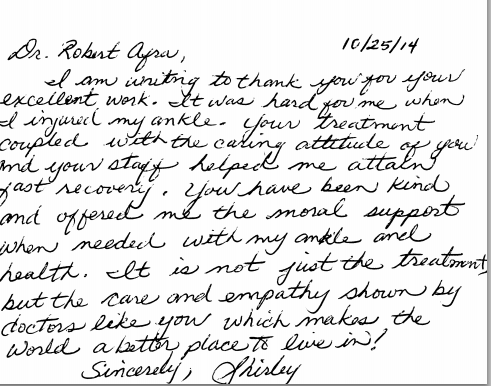 Overall, it was a great experience and we were happy for the referral. I saw Dr. Afra for a strained right calf caused by overtraining for long distance races. Dr. Afra is an excellent doctor who thoroughly diagnosed my condition, provided me with a short term and long term treatment plan (physical therapy, exercise , and training recommendations). 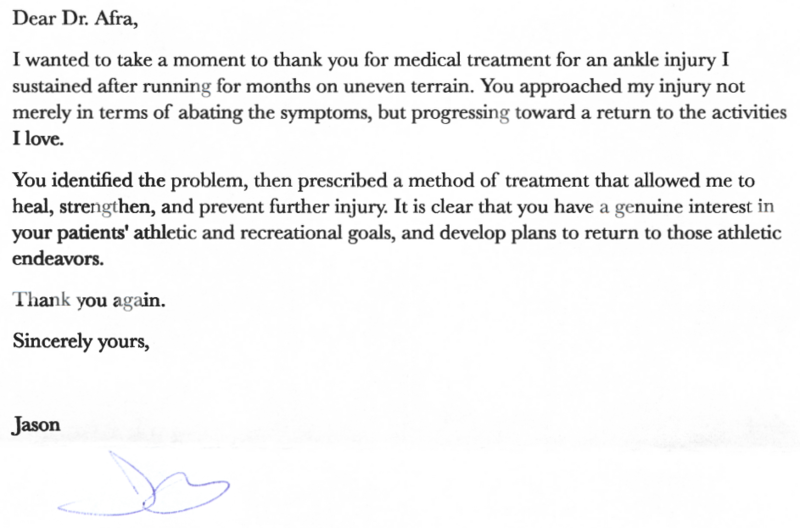 I highly recommend Dr. Afra, he has me back to running stronger than ever! I have been going to do Dr. Afra since January of this year. I had a fall and pain in my shoulder. He has been patient and kind and tried to do everything there was to do to so that I can avoid surgery. Finally in June there was nothing else to do but have the surgery. My surgery went perfect and now I am on the road to recovery! He always takes his time with me and answers all of my questions, even if we discussed it before. He has the best bed side manner of any Dr. I have ever had! I would highly recommend Dr. Afra if you are in need of an orthopedic. Dr Afra has helped my family through several broken bones over the past few months (both our sons broke bones in sports-related accidents). 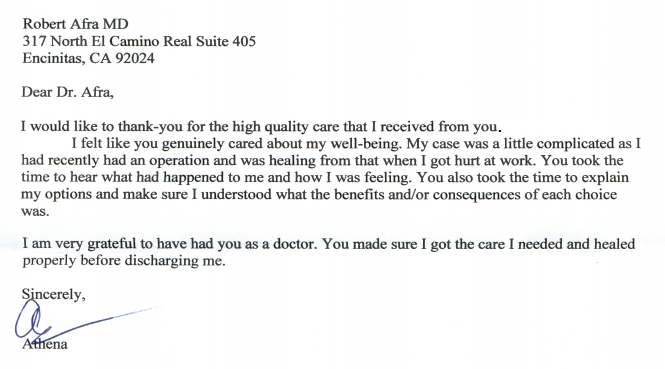 My experience with Dr Afra has been excellent. I’ve found him to be very kind, warm, and knowledgeable. He has a really nice way with children. I’ve found his staff to be friendly and appointments are on-time. And when I had to call in a panic on a Friday afternoon to say “the school says my son fell and may have broken his collarbone”, they were able to see us as soon as I could get my son to the office. I highly recommend Dr Afra. I started getting treated by Dr. Afra toward the end of February 2013. After I had found out I broke my tib-fib. He saw me immediately and from the moment I met him he was so nice and welcoming. He explained I would have to get surgery ASAP. After he preformed my surgery I would go see him for follow ups every 2 weeks on my progress. He always answered any question\concerns. He was very understanding and very detailed with how I had to take care of my injury. He took his time to explain what was yet to come. He made the whole process a lot easier to cope with. He made the injury seem less painful than it was. In the end I got back on track with walking thanks to his assistance. Even when it came to his staff, the assistants, they were really nice and helpful.